There wasn’t a biblical rainstorm in progress! Last year’s winner Donnie Campbell joined course designer Ricky Lightfoot in a quite stunning turn of pace for the start of any 50 mile race; I’d guess they were going at roughly 5 minute mile pace which saw them out of sight within five hundred metres of the start. Arriving on the night before in heavy mist provided hope of cloud inversion for parts of the course and the dread of confusion for other sections, however the weather conditions turned out to be perfect for the task in hand. Single figure temperatures and an overcast day did not prevent heavy sweating on the climbs though as competitors headed up to Scafell Pike and the first control point. An absence of any wind chill was welcome as the course unfolded, as was the legacy of such a dry year making ‘The Bog’ (seriously, that is what it is called on the map, so being singled out for such a title does set an expectation!) nice and runnable. Sadly, exception had been taken to the placement of the markers for the event and thus a great number had been removed. Whilst this did cause some confusion on the course and the odd “inefficient line” it certainly didn’t impact too much on the enjoyment of the participants; universally agreeing on what an outstanding route this really is. It has everything – a lovely wooded trail section to start with, classic Lakeland fell climbs and traverses, ridge runs, a descent worth of a bottom slide and the final climb and descent that just keeps on giving; although I’m pretty sure I don’t just speak for myself when I say I was happier with the downhill gifts than I was with the uphill ones! It’s easy to forget to look around whilst in a race like this, but those that did were thoroughly rewarded. The views looking back towards Scafell Pike from High Raise were stunning, the sight of Keswick and the surrounding terrain were thoroughly welcome and reward enough, but the view back from Helvellyn along the Bob Graham route and Thirlmere won the day for me, especially where shafts of light broke through the cloud to highlight small areas. Breath-taking. Once again the race proved to be quite a draw, bring people from all over the country and as far away as Russia! Sarah Morwood had made the journey from Devon and certainly made her mark on the course, challenging hard for 3rd place overall and settling for 5thin the end. Sarah was a joy to run with and thoroughly entertaining – as she was waxing lyrical about the beauty of the surrounding views I couldn’t help but feel that this coupled with her love of real ale and her ability to relentlessly climb made this race a perfect match. Her time of 10h 30m certainly marked her out as one to watch on the mountain ultra running scene. There is no denying that the checkpoint at Latrigg car park holds both hope and anguish. Knowing that the final chunk of the journey is all that stands between you and the finish line provides initial relief; however, knowing there are ten miles and a big never ending climb standing between you and a glorious downhill quickly shifts that relief into a mental challenge – a left turn and fifteen minutes rather than a right turn and over and two hours would see you in Keswick with a pint in hand. A tough call indeed! This year RD Ian Mulvey introduce an option to call it a day and make that left turning but still get an official time – whilst some may say it’s a temptation too far, I felt it was an excellent and practical nod to safety out on the mountain. Coupled with the iconic start/ finish line and warm post race area, it made for a real improvement on an already superb race. The trail out from Latrigg is one of those cruel gradients that you know you should run but desperately want to walk; it almost makes you feel guilty! Keeping the head down and pretending it is flat works well. On more than one occasion I asked myself “why can’t I just turn left and head up it now?” but that would have meant less time out on this fantastic course… and maybe I just needed a gel to pick me up! In the end the day belonged to Ricky Lightfoot setting the course record in a mind bending 8:51:55. Both Ricky and second placed Donnie Campbell (9:23:10) had been out of sight all day. 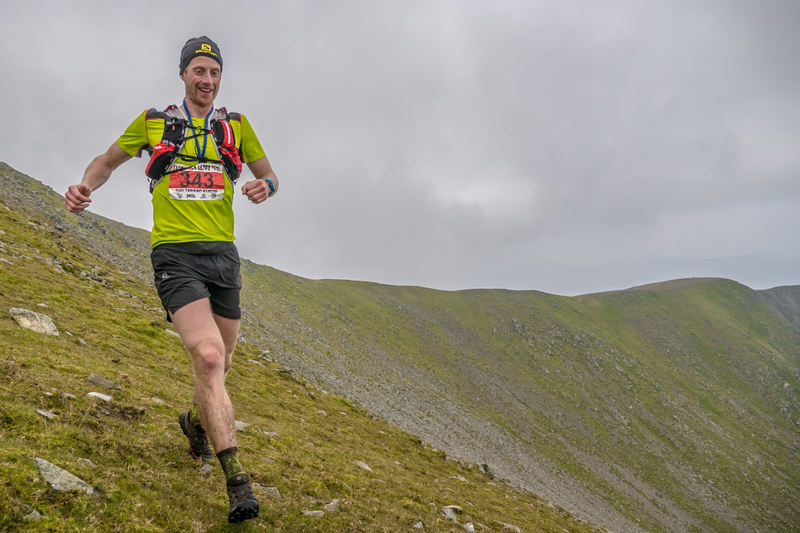 Howard seal (10:03:06) kept the pressure on and pulled away in the end on take third after a battle between 3rd and 5th that raged from Helvellyn onwards. Sarah Morwood was the clear winner in the ladies’ race and 5th overall in 10:30:24. Excellent performances from Cecily Shepherd (13:19:48) and Keziah Higgins (13:56:28) saw them take 2nd and 3rd respectively – Keziah was all smiles after a sneaky sprint finish over the final 500m trying to creep up on James Quigley and David Dixon. There is no doubt that the day was made by the fantastic team behind the event. From Ian’s core organisation, marking and safety team through to the every smiling aid station heroes that dotted the course. I know I speak on behalf of all competitors when I extend my heartfelt thanks for their generous giving of time so we can indulge in our passion for adventure. The excellent post race massage, soup and roll were very welcome, as was finding out that the Gelato shop was open late! Thanks to Steve Ashworth for providing images. 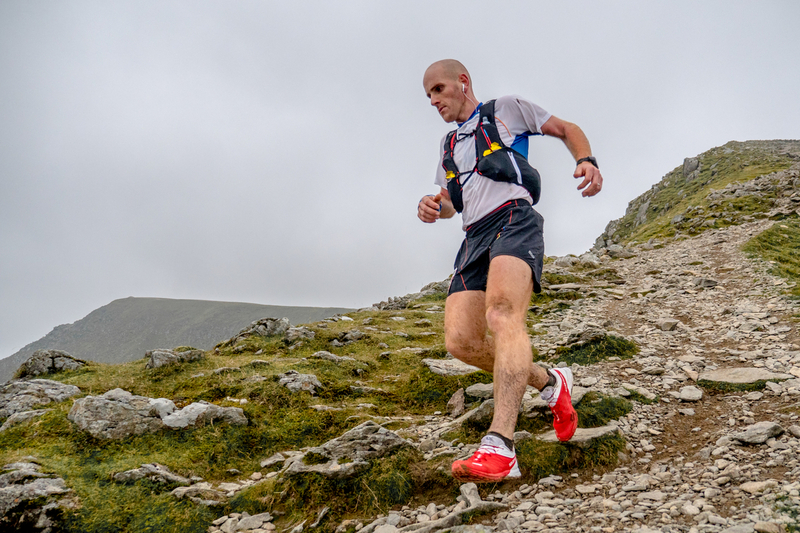 This entry was posted in Uncategorized and tagged 3x3, donnie campbell, helvellyn, high terrain events, keswick, lakes, ricky lightfoot, salomon, scafel, scafell, scuffle. Bookmark the permalink.